Born in 1967, Dong is a native of Fuzhou, Fujian province. 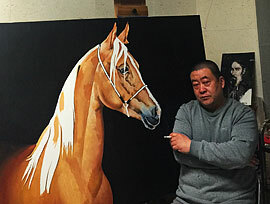 Dong studied oil painting at Xi’an Art Academy and was graduated in 1989. He continued his study and research at the academy and subsequently obtained a Master Degree in 2010. Currently, Dong is a senior journalist and producer at the Xi’an Television. As an artist, Dong had participated in many art exhibitions in the country and abroad. As a journalist, he had the opportunities to travel extensively to the vast secluded territories in northwest China and along the ancient Silk Road to conduct research on the livelihood of various minority races. Today, Dong devotes the bulk of his time on painting and producing documentaries for the TV station on art and culture of the minorities in China. “This is a life time job for me and may not be enough,” said Dong.